Sandos Caracol Eco Resort & Spa, is a Playa del Carmen all inclusive hotel for nature lovers located on a beautiful beach in Riviera Maya, only 45 minutes from Cancun and 15 minutes from Playa del Carmen. Escape to an array of beautifully appointed rooms stretching from the magnificent Mexican Caribbean to the lush green jungle. There’s something for everyone at Sandos Caracol. Whether you prefer naps on the beach, treks through the jungle or drinks by the pool. It’s a scientific fact that vacation calories don’t count. Indulge at our wide range of buffet, à la carte and snack bar dining options. 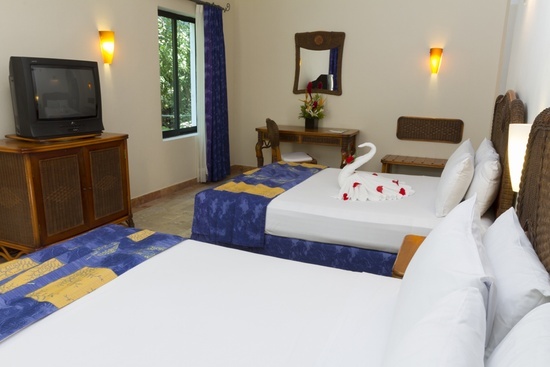 Our comfortable Standard rooms are generously oversized and are designed in tropical decor. Each room features a private balcony or terrace with a sweeping view of the gardens, the pool, or the lush green jungle. With numerous buffet options, there’s something to please every palate. An easygoing ambience and relaxed dress code make for carefree dining. Being on vacation means not having to plan—so stop by any time. Enjoy a variety of foods, drinks and local fare—like our famous chilaquiles. Perfect for those looking to swing by for a quick treat, refreshing drink or a small meal. No need to bother making a reservation, stop by any time. Yeah, that's a swim-up bar. Kids can cool off at the resort’s fun-filled water park. While the kids are having a blast, parents can kick back and relax poolside in the warm Caribbean sun with drink in hand. Here at Sandos Caracol Eco-Resort & Spa, we strive to be the number one eco-hotel in the Riviera Maya. That means not only highlighting the beauty of our natural surroundings, but also continually innovating how we conserve our most precious resources. We’re committed to helping protect the planet through reducing the collective impact of our resort’s daily activities, and by raising awareness amongst our workers, guests, suppliers and local community. To help take care of our environment during your stay, please use biodegradable sun lotions and conserve water by reusing the hotel towels. Sandos Caracol Eco-Resort & Spa works to better the lives of local school children in Playa del Carmen. Help us to give back by bringing school supplies. Sandos Caracol Eco-Resort & Spa is the perfect vacation destination for families. From the young, to the young at heart, there is an array of activities for everyone to enjoy. Our friendly and attentive staff makes every stay unforgettable. Supervised Kids Club with playground, crafts, TV, movies, sports and ecological activities. Sandos Caracol Eco-Resort & Spa offers a variety of products for sale in the shopping area. From fine jewelry to traditional arts & crafts you are sure to find something to bring home with you along with the memorable experiences of an unforgettable trip. The main pool offers a little something for everyone. Spanning nearly the entire length of the Royal Elite Ocean Front section, guests will be immersed in the beautiful views offered by the Mexican Caribbean, only a few steps away. Situated at the center of the resort’s property across from Spa Sandos are two full-size tennis courts. For those who prefer nighttime play, both courts are equipped with lighting. Bring your own gear or use ours. Discover the wonders of ancient Mayan culture. According to Mayan beliefs, the jaguar spirit lives in all people, empowering us to rise up and explore. It is this spirit that has driven us all, since the time of ancient travelers, to reach this place called Xcalacoco. It is here, on this land, with traditional dances and ceremonies that our community continues to pay homage to the sacred elements of Heaven and Earth, Water and Air, Fire and Life. Day 1: Cenote OfferingAccording to Mayan legends, the Offering to Chaac is based on a beautiful love story between a brave prince, Chachazib, and a beautiful princess, Nicte-Ha. Their story took place beside the clear waters of a sacred Mayan cenote. The two shared a love so profound and tragic that their story continues to be shared in local legends to this day. Day 2: Ceremony of FireSurrounded by the intense heat of the fire, the Chilam gives thanks for all the kindness and gifts the Great Creator offers us each day—the sacred elements of Water, Sun, Wind, Earth and Life. As the villagers dance to thunderous drums, the entire community of Xcalacoco unites in a common prayer for harmony. In this final ceremony we make a collective commitment to continue feeding the Fire of Life. Bike Path: Take a trip through the property’s abundant natural attractions, including a nearby authentic Mayan archeological site. The Underground Springs Route: This wilderness path leads through the jungle and past a series of natural underground springs. Mangrove Path: Explore one of the most important coastal habitats along the Mexican Caribbean. Mayan River: Take a tranquil boat ride through a winding river and encounter native plants and animals along the way. Bird Sanctuary: Admire a multitude of multicolored birds in a lush environment. Deer Encounter: Observe white-tailed deer in a natural jungle habitat. Discover the Mayan Jungle: An abundance of local wildlife permeates the jungle—over 60 species of mammals, birds, reptiles and amphibians. Turtle Lagoon: Several species of freshwater turtles sun themselves in our lagoons. Iguanas: These prehistoric jungle reptiles are present throughout the property. Mangrove Crabs: These eye-catching crustaceans delight guests with their bright colors and peculiar scampering. Plant a Tree: Sandos supports the conservation of Mexican rainforests in Quintana Roo. Guests are invited to take part in this important program. All Inclusive Water SportsKayaks, boogie boards, snorkeling gear, Hobie catamarans (insurance fee), scuba demo. No matter what type of event you have in mind, the Riviera Maya is the perfect place to hold it. At Sandos Caracol Eco-Resort & Spa, we have all the facilities and personalized services to make your event a memorable one. If you want to organize a quality event in a unique location surrounded by a natural environment, the Riviera Maya is the place you're looking for. Celebrate group events, conventions, weddings, or business meetings at Sandos Caracol Eco Resort & Spa. We offer a unique hotel that exudes tranquility and exclusivity with comfortable facilities for a wide-range of group and event types. We also offer personalized attention to every detail to ensure you will have an unforgettable event. Picture yourself experiencing the moment of a lifetime, surrounded by your friends and family, while exchanging vows amongst a cool ocean breeze and soft white sand. Playa del Carmen offers the perfect couple a unique and memorable destination wedding along the magnificent Mexican Caribbean.